Oriskany (CVA-34), an attack aircraft carrier, was laid down 1 May 1944 by the New York Naval Shipyard, launched 13 October 1945; and sponsored by Mrs. Clarence Cannon. While still incomplete, her construction was suspended 12 August 1947. She remained in a state of preservation until after the outbreak of hostilities in Korea in June 1950, then was rushed to completion. She commissioned in the New York Naval Shipyard 25 September 1950, Capt. Percy H. Lyon in command. Oriskany departed New York 6 December 1950 for carrier qualification operations off Jacksonville, Fla., followed by a Christmas call at Newport, R. I. She resumed operations off Jacksonville through 11 January 1951, when she embarked Carrier Air Group One for shakedown out of Guantanamo Bay, Cuba. After major modifications at New York Naval Shipyard 6 March through 2 April 1951, she embarked Carrier Air Group Four for training off Jacksonville, then departed Newport 15 May 1951 for Mediterranean deployment with the 6th Fleet. For the next few months she added her far-reaching air arm to the strength of the 6th Fleet, the silent, flexible, and controlling weapon of deterrence to overt Soviet aggression in the Mediterranean and the Near East. The mobile 7th Fleet was deeply committed to a shooting war to help restore the independence and freedom of South Korea. Oriskany was part of the affirmative answer to the crucial question as to whether the Korean War would have an affect upon the Navy's ability to maintain the status quo in the Mediterranean. Having swept from ports of Italy and France to those of Greece and Turkey, thence to the shores of Tripoli, Oriskany returned to Quonset Point, R. I. 4 October 1951. She entered Gravesend Bay, New York, 6 November 1951 to offload ammunition and to have her masts removed to allow passage under the East River Bridges to the New York Naval Shipyard. Overhaul included the installation of a new flight deck, steering system, and bridge. Work was complete by 15 May 1952 and the carrier steamed the next day to take on ammunition at Norfolk 19-22 May. She then got underway to join the Pacific Fleet, steaming via Guantanamo Bay, Rio de Janeiro, Cape Horn, Valparaiso, and Lima, arriving San Diego, Calif. 21 July. Following carrier qualifications for Air Group 102, Oriskany departed San Diego 15 September 1952 to aid UN forces in Korea. She arrived Yokosuka 17 October and joined Fast Carrier Task Force 77 off the Korean Coast 31 October. Her aircraft struck hard with bombing and strafing attacks against enemy supply lines and coordinated bombing missions with surface gun strikes along the coast. Her pilots downed two Soviet-built MIG-15 jets and damaged a third, 18 November. Strikes continued through 11 February 1953, heaping destruction upon enemy artillery positions, troop emplacements, and supply dumps along the main battlefront. Following a brief upkeep period in Japan, Oriskany returned to combat 1 March 1953. She continued in action until 29 March, called at Hong Kong, then resumed air strikes 8 April. She departed the Korean coast 22 April, touched at Yokosuka, and then departed for San Diego 2 May, arriving there 18 May. Following readiness training along the California coast, Oriskany departed San Francisco 14 September 1953 to aid the 7th Fleet watching over the uneasy truce in Korea, arriving Yokosuka 15 October. Thereafter she cruised the Sea of Japan, the East China Sea, and the area of the Philippines. After providing air support for Marine amphibious assault exercises at Iwo Jima, the carrier returned to San Diego 22 April 1954. She entered San Francisco Naval Shipyard for modernization overhaul; completed 22 October when she stood out to sea for the first of a series of coastal operations. Oriskany arrived at Yokosuka from San Francisco 2 April 1955, and operated with the Fast Carrier Task Force ranging from Japan and Okinawa to the Philippines. This deployment ended 7 September and the carrier arrived Alameda, Calif. 21 September. 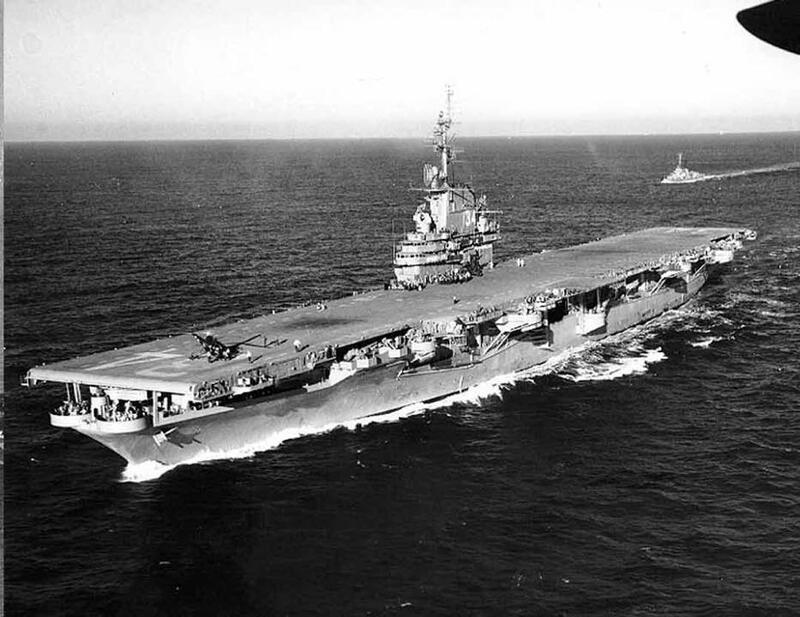 The attack carrier cruised the California coast while qualifying pilots of Air Group 9, then put to sea from Alameda, 11 February 1956, for another rigorous Westpac deployment. She returned to San Francisco 13 June and entered the shipyard for overhaul, 1 October. She decommissioned there 2 January 1957 for modernization work that included a new angled flight deck and enclosed hurricane bow. New, powerful steam catapults were installed by the Puget Sound Naval Shipyard, Bremerton, Wash.
Oriskany recommissioned at the San Francisco Naval Shipyard, 7 March 1959, Capt. James Mahan Wright in command. Four days later, she departed for shakedown out of San Diego with Carrier Air Group 14 embarked. Operations along the west coast continued until 14 May 1960, when she again deployed to WestPac, returning to San Diego 15 December. She entered San Francisco Naval Shipyard 30 March 1961 for a five-month overhaul that included the first aircraft carrier installation of the Naval Tactical Data System (NTDS). The carrier again stood out of San Diego 1 August 1963 for Far Eastern waters, with Carrier Air Group 16 embarked. She arrived Subic Bay 31 August 1963; thence to Japan. She stood out of Iwakuni, Japan, the morning of 31 October en route the coast of South Vietnam. There, she stood by for any eventuality as word was received of the coup d'etat taking place in Saigon. When the crisis abated, the carrier resumed operations from Japanese ports. Oriskany returned to San Diego 10 March 1964. After overhaul at Puget Sound Naval Shipyard, she steamed for refresher training out of San Diego, followed by qualifications for Carrier Wing 16. During this period her flight deck was used to test the E-2A Hawkeye, the Navy's new airborne early warning aircraft. She also provided orientation to senior officers of eight allied nations. Oriskany departed San Diego 5 April 1965 for Westpac, arriving Subic 27 April. By this time more United States troops had landed in South Vietnam to support Vietnamese troops against increased Viet Cong pressure to destroy the independence of that nation. Oriskany added her weight to the massive American naval strength supporting the freedom of South Vietnam. In combat operations that brought her and embarked Carrier Wing 16 the Navy Unit Commendation for exceptionally meritorious service between 10 May and 6 December 1965, she carried out over 12,000 combat sorties and delivered nearly 10,000 tons of ordnance against enemy forces. She departed Subic Bay 30 November and returned to San Diego 16 December. Oriskany again stood out of San Diego for the Far East 26 May 1966, arriving Yokosuka 14 June. She steamed for "Dixie Station" off South Vietnam 27 June. Wearisome days and nights of combat shifted to "Yankee Station" in the Gulf of Tonkin 8 July. In the following months there were brief respites for replenishment in Subic Bay. Then, back into the action that saw her launch 7,794 combat sorties. The carrier was on station the morning of 27 October 1966 when a fire erupted on the starboard side of the ship's forward hangar bay and raced through five decks, claiming the lives of 44 men. Many who lost their lives were veteran combat pilots who had flown raids over Vietnam a few hours earlier. Oriskany had been put in danger when a magnesium parachute flare exploded in the forward flare locker of Hanger Bay 1, beneath the carrier's flight deck. Her crewmen performed fantastic feats in jettisoning heavy bombs which lay within reach of the flames. Other men wheeled planes out of danger, rescued pilots, and helped quell the blaze through three hours of prompt and daring actions. Medical assistance was rushed to the carrier from sister aircraft carriers USS Constellation (CVA-64) and USS Franklin D. Roosevelt (CVA-42). Oriskany steamed to Subic Bay 28 October 1966, where victims of the fire were transferred to waiting aircraft for transportation to the United States. A week later, the carrier departed for San Diego, arriving 16 November. San Francisco Bay Naval Shipyard completed repairs 23 March 1967 and Oriskany, with Carrier Air Wing 16 embarked, underwent training. She then stood out of San Francisco Bay 16 June to take station in waters off Vietnam. Designated flagship of Carrier Division Nine in Subic Bay 9 July, she commenced "Yankee Station" operations 14 July. While on the line, 26 July, she provided medical assistance to the fire-ravaged attack carrier USS Forrestal (CVA-59). Oriskany returned to the Naval Air Station pier at Alameda Calif., 31 January 1968, and entered San Francisco Bay Naval Shipyard 7 February for an eight month overhaul. Upon completion of work, the carrier underwent refresher training and flight qualifications before deploying to the Far East in April 1969. Following twenty-five years of service, Oriskany was decommissioned 30 September 1975. She was stricken from the Naval Vessel Register in July 1989, and sold for scrapping on 9 September 1995. However, the contractor defaulted and the ship was repossessed by the Navy, with the contract terminated 30 July 1997. The ship remained at the Beaumont Reserve Fleet in Beaumont, Tex., until December 2004 when she was towed to Pensacola, Fla., for preparation to be sunk as an artificial reef. Oriskany was sunk 24 miles off the coast of Pensacola, Fla., on 17 May 2006. The 888-foot ship took about 37 minutes to sink below the surface. Oriskany received two battle stars for Korean Service and five for Vietnamese service.